The Palmetto Warrior Connection is looking to fill the following position: Fundraising and Social Media Intern. Read here for internship description. Palmetto Warrior Connection (PWC), granted by America’s Warrior Partnership® and in collaboration with Palmetto Goodwill, is to be the first stop for Palmetto State Veterans for a holistic approach to care. PWC is part of a national community integration initiative headed by America’s Warrior partnership (AWP). This Community Integration program is an initiative that seeks to build self-sustaining organizations that serve the Warrior as well as their local community. As part of this program, PWC follows the AWP national model of Connect, Educate, Advocate, and Collaborate in order to bridge the gap between warrior and civilian life. Our Mission is to empower the Warrior and their family utilizing collaboration, advocacy and education by promoting relentless quality care. The Lowcountry Orphan Relief organization is looking for volunteers to create a 5-10 minute video to promote the organization’s major fundraiser, The Gatsby Gala, in September. The video will feature the organization’s founder Lynn Young and will highlight the work of the organization since 2003. If you have video production experience and are interested in this opportunity, please email Jane Wolfe, Lowcountry Orphan Relief Donation Committee Head, j_wolfe@comcast.net. The Medical University of South Carolina is looking to fill the special events and fundraising internship for the Hollings Cancer Center. The internship is for fall (2016) and spring (2017) semesters. Read more about the internship description here. The Preservation Society of Charleston is looking for volunteers for the annual Fall Tour of Historic Homes and Gardens. Would you like to work with an award-winning downtown marketing communications firm? We seek an intern to provide great support, who is interested in social media strategy, analytics, scheduling programs and digital trends. Our small team environment affords hands-on experience in all aspects of social media management, PR, marketing, media buying and events. Whether we are executing a targeted PR campaign, implementing paid and social media programs or producing a large-scale event, we work to provide clients with top-notch support. If you want to experience a real work environment and gain the knowledge of 20+ years of PR and media skills, this is the internship for you. Visit touchptcom.com to learn more and email your resume to cristy@touchptcom.com. Sen. Tim Scott (R-S.C.) is now accepting applications for congressional internships in his Washington, D.C., North Charleston, Columbia and Greenville offices for the fall 2016 semester. The intern program is open to undergraduate and graduate students who have a strong interest in public service, government and press. The program provides students with valuable work experience and an opportunity to work with professionals in legislative, constituent service, and press roles. Internship hours are flexible to accommodate students’ course schedules, but generally run 8:30 a.m. to 5:30 p.m., Monday through Friday. Interested South Carolina students should contact the internship coordinator at internships@scott.senate.gov or (202) 224-6121. The Office of Sustainability is now accepting applications for its 2017 academic year internship. There are positions available in a diverse range of initiatives: from Social Media and Web Design, to more hands on initiatives like Zero Waste Infrastructure and the Urban Garden Apprenticeship. Our past interns have come from a diverse range of interests, something that is reflected in our intern majors and minors graph, which can be found on our Internships page here. Regardless of your background, the Office of Sustainability has a place for you. To apply, visit the Office of Sustainability homepage and open the Sustainability Internship Application at the bottom of the page, or click here. 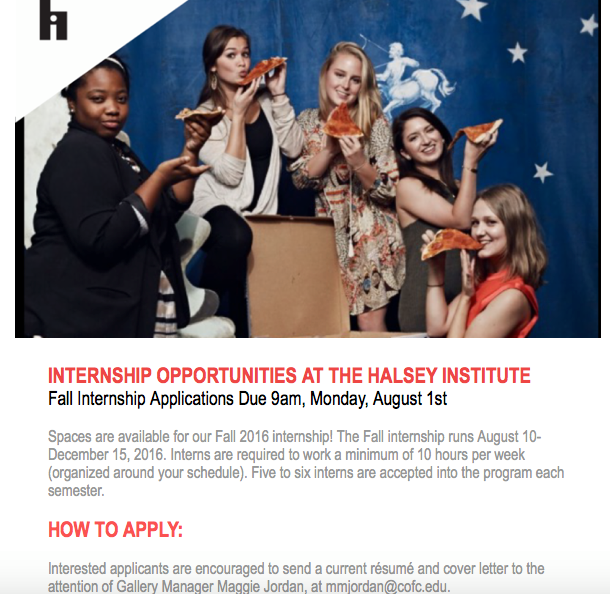 The Halsey Institute of Contemporary Art is now offering fall internship opportunities. The fall internship runs from August 10-December 15, 2016. Interns are required to work a minimum of 10 hours per week (organized around your schedule). Five to six interns are accepted into the program each semester. Applications are due by 9:00am, August 1st. To apply, please send a current resume and cover letter to Maggie Jordan (Gallery Manager) at mmjordan@cofc.edu. Water Mission is looking for students who are interested in internships in media relations and video production. Rawle Murdy is looking for Fall interns for our Public Relations/Social Media department! Interns will actively participate in all aspects of Rawle Murdy’s public relations and social media team efforts. Responsibilities include: drafting press releases, content development, and assisting in the management of client’s social media accounts. Some knowledge of advertising, marketing, public relations, and related responsibilities required. Previous internship experience a plus. Please submit a cover letter and writing samples with your resume. Please send all resumes to srunkle@rawlemurdy.com.